Cognitive Behaviour Therapy (CBT) is considered the ‘gold standard’ treatment for a wide range of psychological and mental difficulties. We at Angus Munro Psychology are Cognitive Behaviour Therapy specialists offering confidential and evidence-driven CBT to enable anyone in the Sydney area to overcome maladaptive thoughts and pursue lasting change. Whether you suffer from stress, anxiety, depression, panic attacks or another disorder, Cognitive Behaviour Therapy gives you the tools to take control of your thoughts and live a full and enriched life free from unhelpful thinking. Angus and his expert team of psychologists guarantee to work tirelessly to help you overcome the thoughts and feelings that are holding you back from living your best life. We also provide CBT Online Counselling with a qualified counsellor or psychologist who can help clients experiencing from depression, anxiety and stress. Click here to know more about our online counselling programs. If you are suffering from anxiety, stress, depression or any other mental or psychological disorders there are a variety of treatment options to consider. One of the most effective treatments is Cognitive Behaviour Therapy (CBT). The CBT approach centres on the idea that there is a direct link between the way we think and the way we feel and behave. CBT challenges our perceptions of the world around us and aims to change what may be faulty or unhelpful thought patterns that are causing negative feelings and resulting in unhealthy behaviour. CBT works on the basis that it is not difficult situations and events that are the cause of emotional distress but the thoughts and evaluations of them that our mind creates. We cannot always change out situations, but we can change how we react to them, and that is enough to combat a huge range of mental illnesses. We are cognitive behaviour psychotherapy specialists near you and qualified to treat your particular issue with our latest evidence based techniques and approaches. Cognitive Behaviour Therapy is used to assess internal mental processes and change negative thought patterns into more positive ones. Specifically, CBT focuses on how we process information provided by the senses, how we store this information and ultimately how this sensory information leads to certain behaviours. Specific attention is paid to mental processes such as perception, memory, language and their effect on mood. With the cognitive behavioural therapy approach, maladaptive behaviours are viewed through the lens of the thoughts and feelings that may be causing them. These internal mental processes determine the way we feel and behave. Changing those processes means discovering a whole new world and a whole new way of looking at your situations. Investigating, monitoring and changing how you think will lead to changes in how you act and feel. 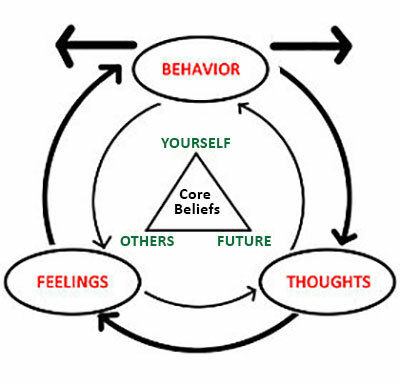 CBT uses an array of structured techniques to accomplish this, ranging from self-monitoring and cognitive restructuring to behavioural experiments. Cognitive Behaviour Therapy has helped clients facing a range of psychological issues ranging from depression, stress and anxiety to eating disorders. At Angus Munro Psychology we offer confidential and evidence-driven CBT to help you overcome the maladaptive thoughts that are inhibiting your life. Our expert CBT therapist in Sydney will guide you through the entire process. Sessions are structured with your needs in mind and our CBT therapist will help you create your own goals and strategies for changing your thought processes. It is easy to grasp and doesn’t take long to learn, making it ideal for people with busy lifestyles. Our CBT psychologists in Sydney will help you learn a range of relevant skills and processes which you will continue to practice and implement on your own. Armed with these new methods to identify faulty thinking and change your perspective, you will be better equipped to handle the stresses and challenges of life. Cognitive Behaviour Therapy is not a long-term treatment- it is all about giving you the power to help yourself. We warmly welcome anyone living Sydney area to visit our clinic for effective evidence based Cognitive Behavioural Psychotherapy. You can call us directly at 0290561779 or get in touch via our contact form.